We have a range of red dot scopes, led focus torches, reflex sights, red and green dot lasers for guns, crossbows and airsoft. Adjustable Green laser with Weaver mount. Be aware of others claiming higher output, ours i..
Laser Range finder with built in pin seeking technology and angle correction. 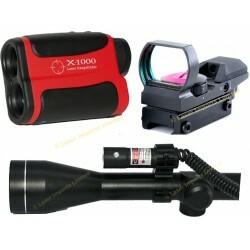 1 Year warranty, ..
You are buying 1x Laser Range finder with built in pin seeking technology 2 Year warranty, ..